Do you work with brides in the Golden Trinagle? Do you appreciate it when another wedding vendor or a previous client refers a new bride to your business? What is each bride referral worth to you and your family? $100? $500? $1000? Every business is different, but whether you design wedding invitations for Beaumont brides or have the newest wedding venue in Tyler County, it is clear that maintaining a steady supply of bride referrals is outstanding for your business. Is your wedding vendor referral team where you need it to be? Did a colleague send you a new bride this week? Last w eek? 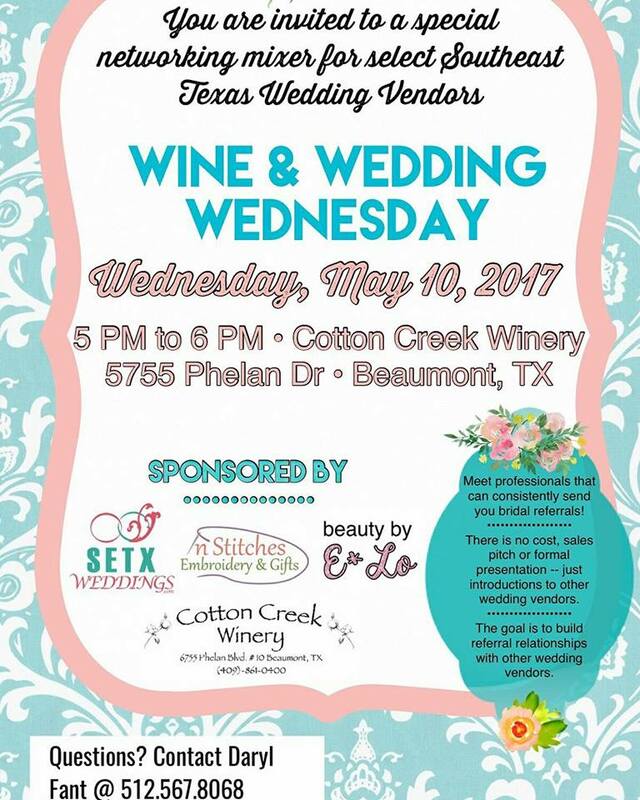 Hosted by: SETX Weddings, Cotton Creek Winery, Emily Lopez Pink Cadillac Director with Mary Kay, and In Stitches Embroidery Beaumont. What is the Southeast Texas Wedding Vendor Mixer? Our Southeast Texas Wedding Vendor Mixers put you in a room with others who work with brides. Who can refer a lot of brides to a Golden Triangle wedding caterer? A local wedding venue. Who can refer a lot of brides to a Beaumont bridal gallery? A wedding planner. You get the idea. Having a dedicated team of non-competing wedding vendors sending you brides year-round can be a true blessing for your business. What are three good referral partners worth? How about five consistent referral partners? Can you imagine five other local wedding vendors who send their brides to you – time after time? What do we do at these events? We understand the importance of a strong business network. We introduce SETX wedding vendors to each other over appetizers and cocktails. What do you do during the mixer? Talk with other Southeast Texas wedding vendors. Make a few friends – and make a few great business contacts who can refer you new brides month after month and year after year. Event follow up: Pick 2-3 wedding vendors you think that you would work well with and invite them for coffee or lunch the week after the SETX Wedding Vendor Mixer. Continue building your referral relationship. Bring a referral to the meeting. Do you have a bride looking for their wedding venue or bridal gallery or planning services? Tell the bride about your referral partner and ask if you can have them contact them. Bring their phone number, wedding date, and e-mail to your referral partner. You can build your business as a Southeast Texas wedding vendor. The SETX Wedding Vendor Mixer Series can help. Are you looking for more help promoting your business to Golden Triangle brides? SETX Weddings is the online bridal magazine for Southeast Texas – over 200 local articles each year for brides in Jefferson County, Hardin County, Tyler County, Orange County, and the surrounding area. On any given day 250 – 1,100 brides browse SETX Weddings looking for current trends, recommended wedding vendors, and ideas for planning their Golden Triangle weddings. Are these brides finding you?